If you have arrived here after learning about the eternal nature of Energy and it's equivalency with Mass, but you haven't explored the unifying principle of Gravitation, please click on the button below. If you have arrived here after learning about the unifying principle of Gravitation, but you haven't explored the eternal nature of Energy and it's equivalency with Mass, please click on the button below. If you understand energy/mass equivalency and you grasp universal gravitation then you're ready to cut to the chase! 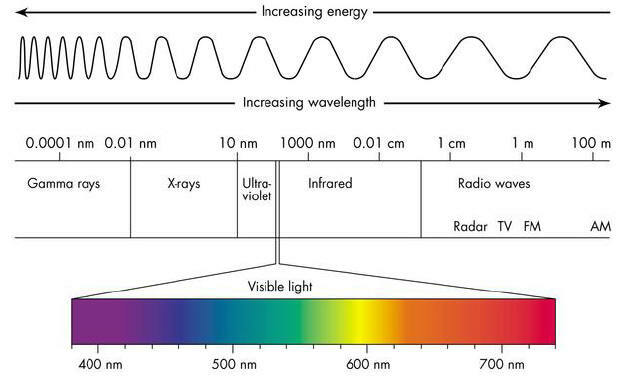 As it turns out, all of those colors, and in fact - everything we see - exists within a tiny bandwidth of frequencies of the electromagnetic spectrum. Furthermore, less than half of the light from the Sun reaching the surface of Earth is in the Visible Range. 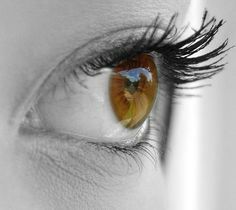 Add to that the fact that we can only look in one direction at a time, restrained for the most part to our immediate surroundings, and you can start to see just how extremely limited our power of sight perception really is. We actually only ever see a minuscule fraction of what exists. Now consider your sense of hearing. Sound waves are distinguished by Frequency just like Electromagnetic Radiation; except that sound is transmitted by the physical vibration of the material that it's being transferred through (i.e. Air, Water, Metal, etc.). The Human ear can hear wavelengths between about 20 to 20,000 hertz (cycles per second). You can see in the graphic above, however, that many other animals can hear frequencies well outside of our range of perception. Many of these sounds are resonating around us much of the time while we remain completely unaware of them. Our sensory organs have evolved to serve a very specific purpose - to help us to survive. That means being able to distinguish food from poison, predator from prey and a potential mate from, well, everything else. That means we must perceive things as separate, therefore our senses must have limitations as a filter. If we could see and hear all the wavelengths of energy and vibration around us, everything would be blurred together and it would be nearly impossible to discriminate anything from another. Out of our acknowledgement with regards to the rampant "misquoting" of our friend, Albert E.; We've included a link to some source information for this note. 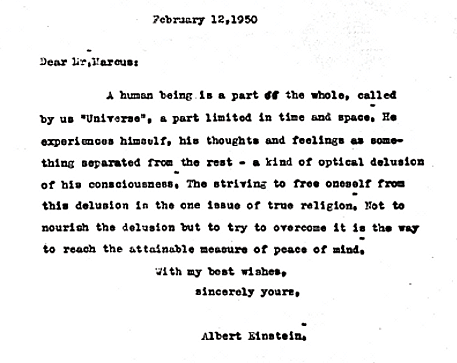 What Mr. Einstein is explaining in this letter to his friend who lost his son to polio, is that there is no real separation between any of us. There is no separation between anything in the entire Universe. Things only seem separate to us as a result of the severe limitations of our sensory perceptions. When combined with the constant reinforcement of this illusion by our own minds and our society - the idea of separateness becomes a difficult delusion to overcome indeed! please press the button above to see how this applies to you! !